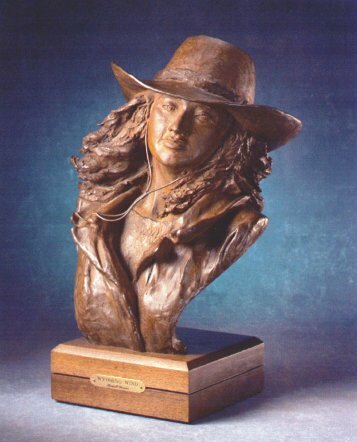 Lenell Deane's sculptures convey the quiet and forgotten moments of life in the West; a young boy with his pups, a mothers moment of reflection with her daughter, a woman's face in the Wyoming wind, a lone Indian dancer. As an artist, Deane's interests in such subjects is a natural outgrowth of her past. she was raised as a native South Texan, and her families ranching interests came part-and-parcel with her upbringing. "As a child, I got a taste for riding and had many wonderful experiences on the ranch. I cherish those memories because it really was a simpler, happier time of life. Much of my art is a reflection of those memories." Her entry into the world of art was an outgrowth of a creative streak she showed during those childhood years. "I always made little things with my hands. I've always enjoyed the creative process. Though my initial interest in fine art began with painting, I quickly realized that sculpting came far more naturally to me. I love the total freedom it provides to create whatever comes into my mind."